HomeCinemaMasalaVarun Dhawan celebrates Diwali in style and here’s the proof! A day ago, Student Of The Year star Varun Dhawan made news owing to his Diwali celebrations. The actor, who has by far maintained silence on his personal life, shared a picture with rumoured girlfriend Natasha Dalal on social media. Varun posted images during the festivities and the actor has been having a gala time with everyone. 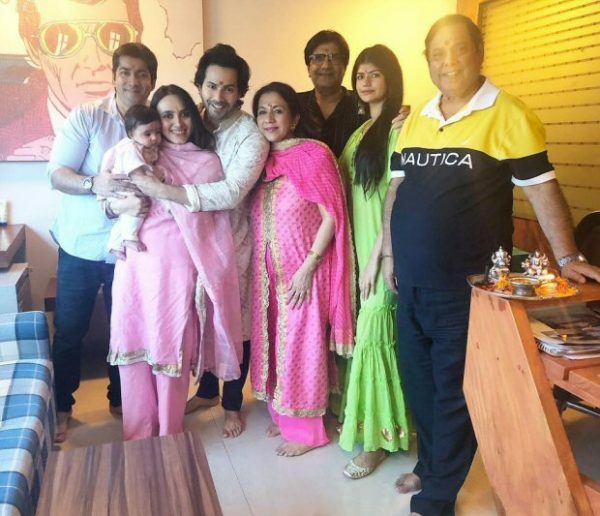 Varun Dhawan also shared a very adorable picture perfect family picture involving his father, mother, brother, sister-in-law and his little niece too. The Bollywood family was seen rejoicing the festivities in Dhawan style and the actor also wished all his fans in this post. Besides that, Anil Dhawan, Varun’s uncle too was a part of the picture. Readers may recall that Anil was recently seen in Andhadhun featuring Ayushmann Khurrana. The Bollywood fraternity seems to have had a fun Diwali with many sharing pictures from the bashes they attended. From Alia Bhatt to Bhumi Pednekar to Karan Johar to Shah Rukh Khan, the social media platform is filled with pictures. On the other hand, coming to films, Varun Dhawan will next be seen in the multi starrer Kalank alongside Alia Bhatt, Aditya Roy Kapur, Sonakshi Sinha, Sanjay Dutt and Madhuri Dixit. He has also been signed for the Katrina Kaif starrer dance film with Remo D’Souza. He has also been added to the cast of a spy thriller that features Janhvi Kapoor opposite him.